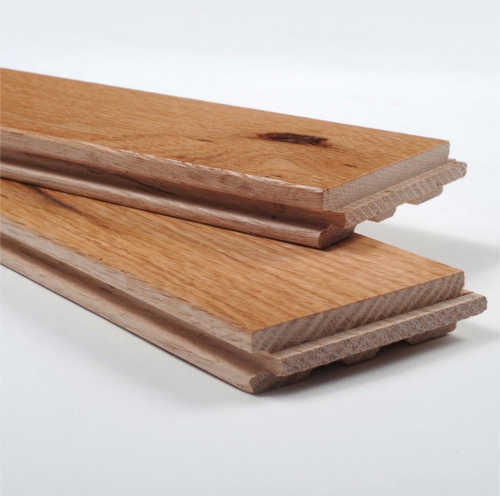 Oak strip is durable, affordable, and readily available. 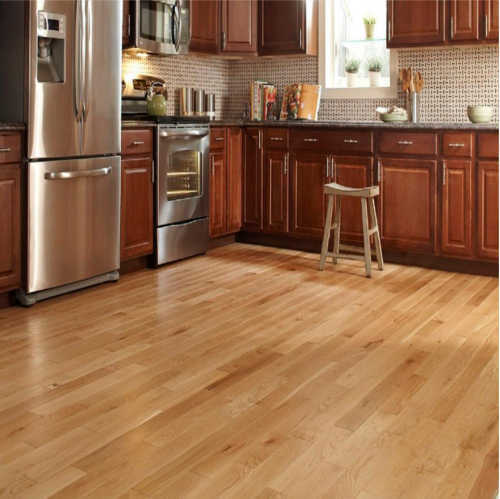 It exemplifies the natural warmth and beauty of hardwood and accepts stains and topcoat finishes easily. While it requires some work upfront, oak strip lasts for decades once installed. Unlike engineered and prefabricated hardwood, you can sand and refinish an oak floor repeatedly throughout its life. Caption: Traditional oak-strip flooring has tight-fitting tongue-and-groove joints milled into the edges and ends of each floorboard. 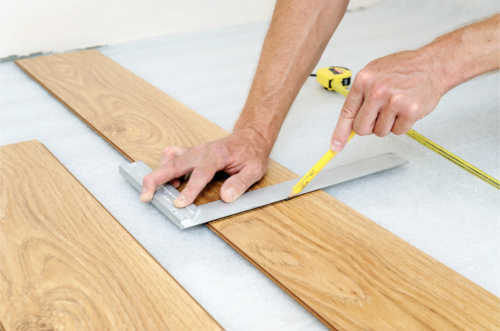 To install the tongue-and-groove oak strips, you’ll need an air compressor and pneumatic flooring nailer that shoots specially designed nails, called power cleats. Once you install the flooring, you’ll need to sand and finish the surface. Don’t worry — you won’t have to purchase all the tools needed; you can rent them at your local home improvement store. 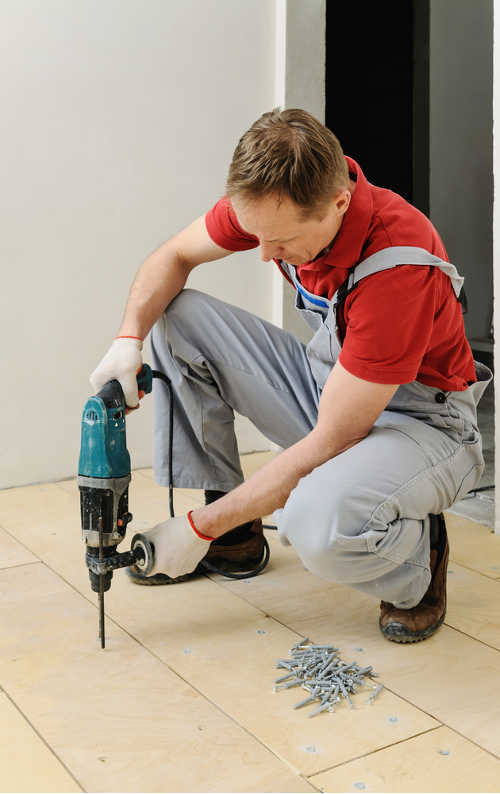 Use a drill to drive 1 ⅝-inch drywall screws through the subfloor in any areas that are loose or squeaky. Patch damaged spots and voids with wood putty or floor leveling compound. Next, cover the plywood subfloor with red rosin paper or, better yet, an asphalt-saturated moisture barrier. Roll the three-feet-wide moisture barrier across the room, then cut it to fit tight from wall to wall. Unroll the next piece, overlapping the first sheet by four inches. Continue in this manner until you’ve covered the entire subfloor. You don’t need to tape or staple down the moisture barrier. Determine whether you need to cut down the floorboards in the first row to ensure that the last row is at least 1 ¼ inches wide. Measure the room width, then divide by the width of a floorboard. That gives you the number of full-width boards needed to cover the floor, plus the width of any remaining board. If the remaining board is less than 1 ¼ inches wide, then you’ll need to cut the first-row planks to the proper width. At the starting wall, measure from the wall a distance equal to the width of the first-row floorboards, then snap a chalk line parallel to the starting wall. This line represents the first row of floorboards. From each end of the chalk line, measure across the floor to the ending wall. If the two measurements aren’t equal, adjust the chalk line to ensure that it’s parallel with the ending wall. If you start laying floorboards that are slightly askew, the last row of flooring will be wider at one end than the other. Set the first floorboard in place on the chalk line with its tongue edge facing out. Nail the board to the subfloor with 2-inch finishing nails. Drive the nails at an angle through the exposed tongue. Be sure to bore pilot holes first and space the nails about 16 inches apart. Continue installing floorboards, end to end, along the chalk line. Cut the last board to length with a power miter saw or jigsaw. Don’t worry if the cut is rough — the baseboard moulding will hide it. Next, set into place the first board in the second row, making sure it extends past any end joints in the first row by at least six inches. Stand on the seam between the two boards to align the tongue-and-groove joint. Then use a rubber mallet to pound the second-row board tightly against the first row. Once the seam is tight, use the flooring nailer to fasten the floorboard to the subfloor. Strike the actuator knob on the nailer with the mallet to drive the power cleats through the protruding tongue. Space the cleats six to eight inches apart. 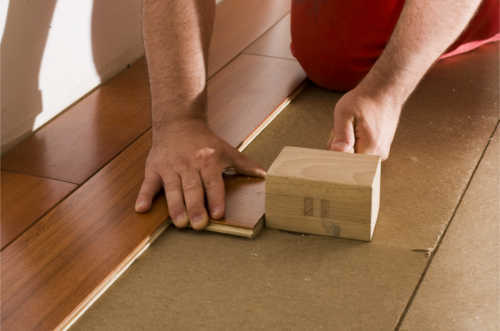 Install the remaining floorboards in the second row, making sure to stagger the end joints by at least six inches. Cut the last floorboard in the row to length and nail it in place. As you work your way across the floor, be sure to pound the joints closed before nailing through the tongues and into the subfloor. When necessary, notch a floorboard around a room corner, closet, or other obstruction with a jigsaw or table saw. As you approach the ending wall, you’ll run out of room for the pneumatic nailer and will once again have to revert to hand-nailing the flooring with two-inch finishing nails. When you reach the very last row, cut the floorboards down to size on the table saw, if necessary, making sure you cut off the tongue edge and keep the groove edge. Then, turn the last-row floorboards upside down and use the mallet to bust off the bottom lip of the groove edge. Leave the upper lip intact. Removing the lower lip makes it much easier to slip the last row into place. 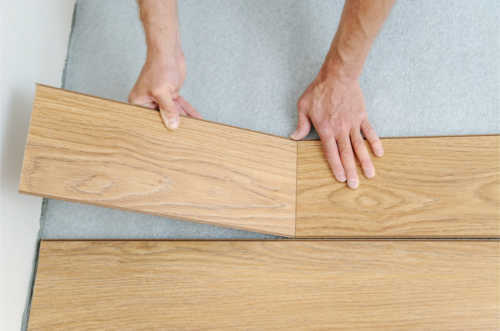 Install the last-row floorboards, using a pry bar to force the joint closed while you face-nail it to the subfloor. 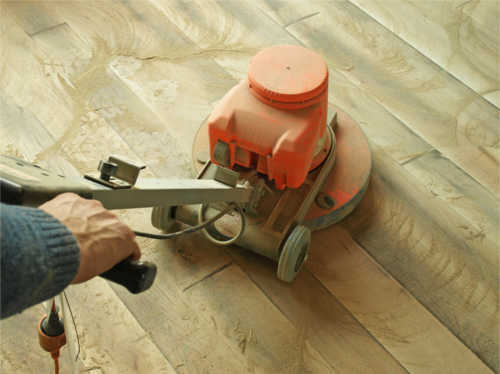 Rent an electric drum sander and sand the floor starting with a super-coarse 40-grit sanding belt. Sand parallel with the floorboards and in the same direction as the wood grain — not across it. Be sure to keep the sander in constant motion — if you stop in one spot for even an instant, you’ll sand a depression into the floor. 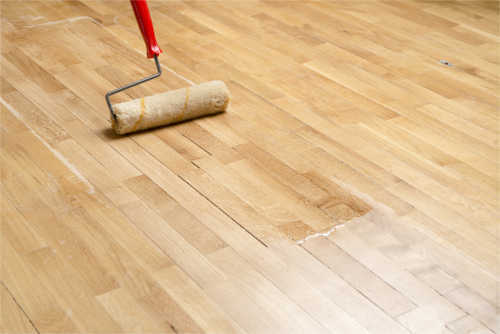 After sanding the entire floor, switch to a slightly finer 80-grit belt and sand the floor again. Then, switch to an even finer 100-grit belt and make the final sanding pass across the floor. To smooth the area around the room perimeter, rent an edge sander, which uses 6-inch-diameter abrasive disks. Attach a 100-grit disk onto the sander and work your way around the entire room perimeter, sanding the floor smooth. When you finish sanding, vacuum the floor clean. The floor will feel smooth, but it isn’t ready to receive the varnish topcoat yet. 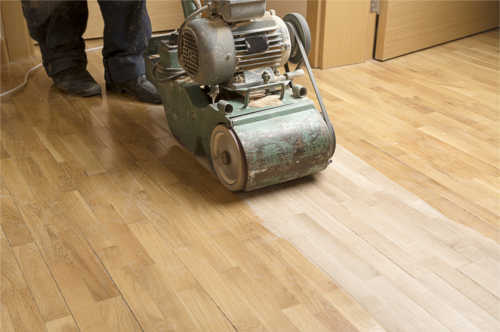 Use an electric buffing machine fitted with a 120-grit sanding screen to screen the floor. Turn on the buffing machine and slowly guide it back and forth across the floor in overlapping passes. One pass over the entire floor is sufficient. When you’re done screening, vacuum the floor clean. For a natural red-oak appearance, finish the oak floorboards with polyurethane varnish or tung-oil varnish. Use a four inch paintbrush to apply varnish around the room’s perimeter, spreading the finish at least six inches from the walls. Next, use a long-handled lamb’s wool applicator to spread a thin, even layer of varnish over the entire floor. Be careful not to leave behind any puddles. Allow the varnish to dry overnight, then smooth the surface with the electric buffer fitted with a 220-grit sanding screen. Vacuum the floor clean. Spread on a second varnish coat using the lamb’s wool applicator. Let it dry overnight, then smooth the floor again with the 220-grit screen. Vacuum the floor clean. Apply a third and final coat of varnish and let the surface dry overnight. Complete the installation by installing baseboard and shoe moulding around the room perimeter, making sure to nail the mouldings to the wall studs, not the flooring. When all the steps are complete, you can sit back and enjoy your new hardwood floor. 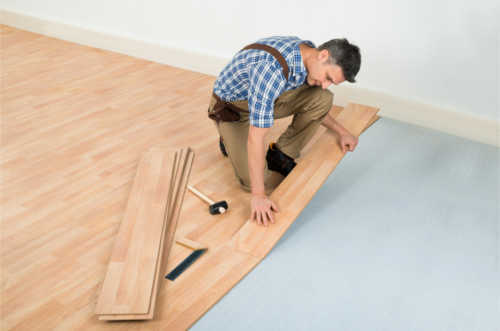 Home improvement expert Joseph Truini writes for The Home Depot about home DIY repair and remodeling projects, such as how to install a hardwood floor and moulding. Visit TheHome Depot to find all the tools and hardwood floor materials you need for the project that Joe talks about in this article. Is there an underlayment that helps to muffle noise between floors? Yes, Anon! Just search google for "wood flooring noise reduction underlayment". You'll find several options.